No-shows will be automatically charged for the first seven nights. No exceptions will be made to this policy. As we’re travellers, we know how to fulfil all your needs and make the best of your stay in Barcelona. 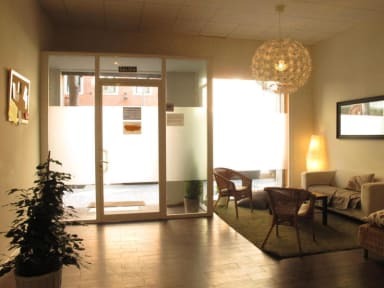 We’re located within walking distance of all the main attractions, bars and shops, from the luxurious Paseo de Gracia Avenue to the historical Gothic, the vibrant Raval and the cosy Borne neighbourhoods. We have four different dorm types. You can choose between two-bed (with private terrace), four-bed, six-bed or eight-bed dorm (be aware that our two-bed dorm has bunk beds). Our hostel offers plenty of computers with 24 hours free internet and Wi-Fi for you to plan your next trips. We provide a fully equipped kitchen for you to be able to save some money and make your favourite dishes.